Coming in for only your seventh start of the season against City is a thankless task and Jonjoe Kenny understandably struggled at right-back against the lively Sane. Too often the 21-year-old was caught out of position, and he was lucky his side were not punished further - although he got little support from Theo Walcott ahead of him. - City have scored with their first shot on target in 15 Premier League games this season – six more than any other team. - Everton have conceded more goals from set pieces than any other Premier League team in all competitions this season (19). 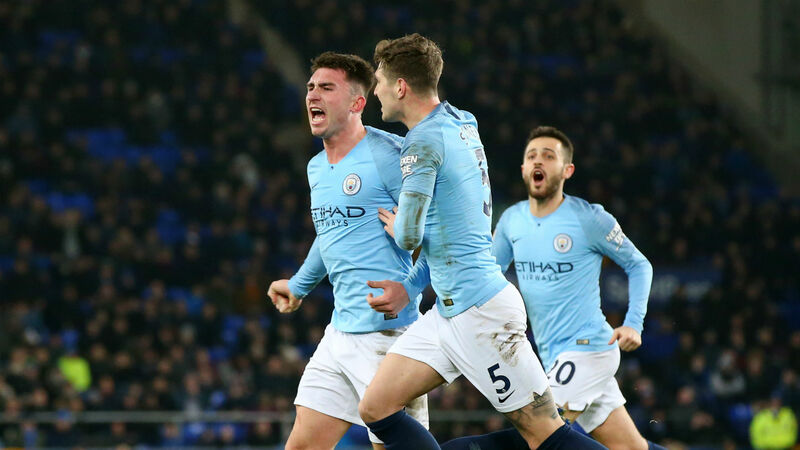 - All four of Laporte's goals in all competitions for Manchester City this season have been headers from set pieces in away matches. - Marco Silva has now lost five Premier League games against Manchester City – two more than he has against any other opponent. - Manchester City have won 10 of their last 11 matches in all competitions (L1), scoring 39 goals and conceding just five. City could be back in second place when they welcome Chelsea to the Etihad Stadium on Sunday, with Liverpool playing Bournemouth 24 hours earlier. Saturday also sees Everton travel to Watford, Marco Silva making his first return to Vicarage Road.